Heat oven to 350°F. In 3-quart saucepan, heat water and butter to boiling. Boil 1 minute, stirring constantly. Add milk; remove from heat. Stir in mashed potato mix with fork until potatoes are desired consistency. Stir in sour cream and cheese. 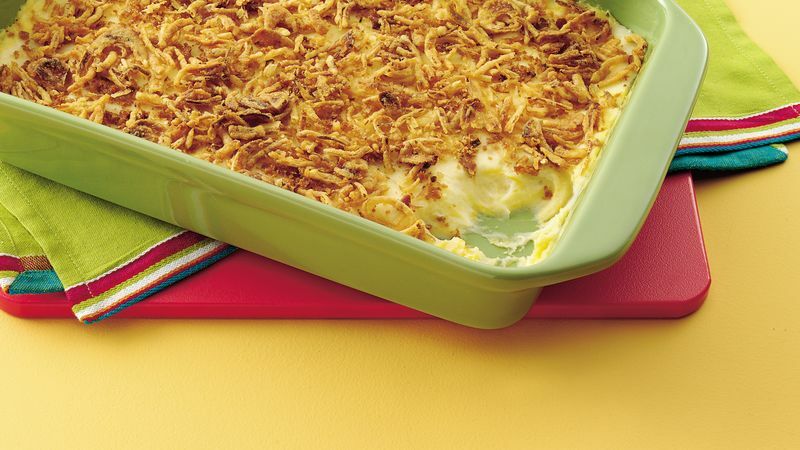 Spoon into ungreased 13x9-inch (3-quart) glass baking dish. Sprinkle bacon and onions over top. To make this casserole ahead, prepare as directed reserving the bacon and onions. Cover and refrigerate the casserole for 6 to 24 hours. Just before baking, top with the bacon and onions and bake 30 to 35 minutes or until hot.